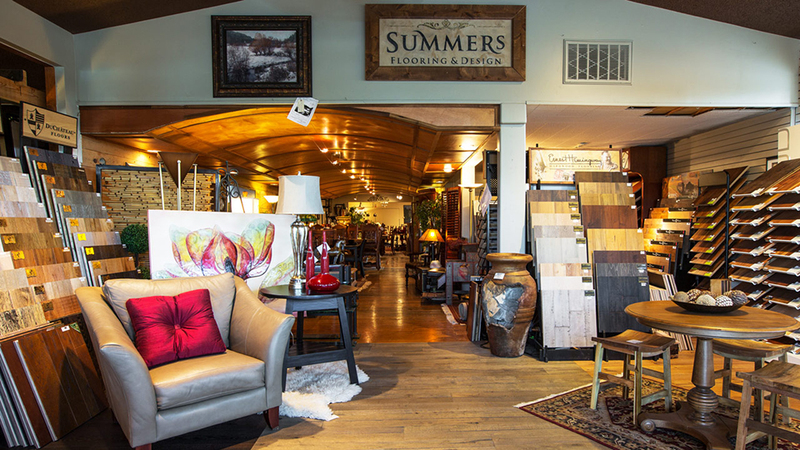 Just on the east side of Hwy 97 above NE Revere Ave, Summers Flooring & Design provides the finest in interior finishes and beautiful top quality consignment furniture since 1954. Locally and family owned and operated, they have worked on numerous projects ranging from simple residences to large-scale commercial structures. Believing that craftsmanship is king, they have worked with every grade of product under rigorous quality standards and are differentiated by the insight and care they provide throughout the process. For a quarter of the cost and half the time of installing a new floor, they can restore the natural beauty of your existing wood floors with maintenance treatments, re-sands and re-finish services to address floors with greater damage. Their dust-containing sanders allow you to be home during the floor treatment and restoration. When you’re building a new home, Summers Flooring & Design wants to help make the design process an enjoyable, one that is smooth and stress-free from beginning to end, assisting you in choosing interior materials that will express the comfort, quality, and enjoyment of your lifestyle. Store hours are Monday – Friday 9:00 a.m. – 5:30 p.m. and Saturday 10:00 a.m. – 4:00 p.m.